Coupe ## $750 1580 7,343 The 1919 Ford line was similar to 1918 except the closed cars no longer had oil lamps. The Coupe no longer had removable side window posts. Note: Add 90 lbs. for starter; 45 lbs. for demountable rims and tire carrier on open cars. Starter and rims were standard on closed cars. # Price effective August 16, 1918. ## Includes starter and demountable wheels. ### Price with solid rubber tires. #### Price with Pneumatic tires. * Fiscal year 1919, August 1, 1918 to July 30, 1919. *** Not indicated in catalog. + Ford News, Nov. 1, 1920, gives a figure of 533,706. ENGINE SERIAL NUMBERS: 2,831,427 to 3,659,971 calendar year. 2,756,252 to 3,277,851 fiscal year (August 1, 1918 to July 31, 1919). MODEL YEAR DATES: January 1919 to August 1919. BODY TYPES: Touring, Runabout, Sedan, Coupelet, Chassis and Truck. MAJOR MODEL YEAR FEATURES:Note: Starter was an option on the open cars at $75. (Weight 95 lbs.) Demountable rims were an additional $25. (Weight 55 lbs.) The 1919 model year began in January 1919 with the introduction of the electrical equipment as standard in the closed cars. Until this time, there was little change in style since the 1917 models, due to the war effort. 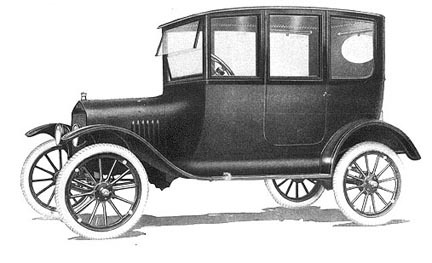 The Coupe was similar to the 1917-18 style but the window posts were no longer removable. Instrument panel appeared on the starter cars only for the first time as a factory installed item. Non-electric cars had no instrument panel. Rear axle assembly modified in several areas; now used a gasket between the halves, different (Slightly larger) wheel oil seal cups, and the filler plug was located lower on the housing than before to help prevent overfilling. Front axle assembly modified; used new radius rod assembly that now fastened below the spring perches. COLORS: All cars were painted black, with black fenders. UPHOLSTERY: Imitation leather in the open cars. The pattern was a stitched vertical pleat design on both seat bottoms and backs. Closed car upholstery was the same as 1918 except that the cowl area was no longer enclosed with leatherette. Quarter panel upholstery in the closed cars was now cloth. FENDERS: Front: Curved and crowned as in 1918. SPLASH APRON: Unchanged from 1918. RUNNING BOARDS: Unchanged from previous year. HOOD: Steel. Hold-down clamps had two ears and were of forged steel. Handles were pressed steel. DASHBOARD (Firewall): Wood, fitted outside the front cowl, hidden by the metal cowl trim strip. This trim strip was redesigned to include a rain gutter to direct water to the sides, away from the coil box. CHASSIS: Same as 1918 Except for the battery-bracket mounting holes. Painted black. STEERING COLUMN ASSEMBLY: Pressed steel, black painted, quadrant, Zinc-plated spark and throttle levers, with flattened metal ends. Gear case was brass but zinc plated, one-piece assembly. Wheel is 15 outside diameter, made of Fordite (synthetic material), and painted black. The wheel spider was iron and painted black. Horn/light switch same as 1918 except for starter-equipped cars where the light switch was located on the instrument panel. FRONT AXLE: Same axle as the 1918 cars. The radius rod now connected below the axle, at the spring perches, making a stronger assembly. Roller bearings in front wheels except in the non-starter, non-demountable open cars. REAR AXLE: Similar to 1918. The oil filler hole was moved down to a point about 1-3/4 below the centerline. Center section was now machined for a paper gasket between the halves. The oil-retaining cups at the wheels are slightly larger but of the same design as the earlier types. DRIVESHAFT HOUSING: Pinion bearing spool was a casting and was held by studs and nuts, the studs being enclosed (not visible) in the housing. Integral front housing for universal joint assembly. REAR RADIUS AND BRAKE RODS: Brake rods had forged ends. Brake rod support brackets rattlers were of the type which go out and wrap down around the rods and are of a reinforced (stronger) design, which continued until the end of Model T production in 1927. Radius rods were of pressed steel with split ends (no forged rear fork). WHEELS: Used 30 by 3 tires in front; 30 by 3-1/2 in the rear. Front wheels now use taper-roller (Timken) bearings except in the non-starter, non-demountable open cars. Hub caps have Ford in script letters. Made in USA on all caps. 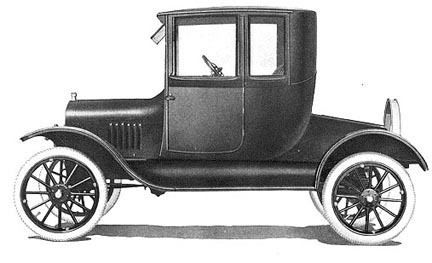 Demountable-rim wheels were standard on closed cars, and optional on the open models; used 30 by 3-1/2 tires all around. SPRINGS: Non-tapered, front and rear. L shaped shackles of the forged type. Oilers were now pressed into the springs and none were used on the shackles as in previous cars. RADIATOR: Same as previous year but had larger mounting holes to fit new spring-mounted arrangement, first introduced on the trucks, then on all cars, which replaced the older bolt and pad method. ENGINE: Modified to accept starter and generator, now standard on closed cars, and optional on the open models after about June 1919. Non-starter engines were discontinued after May 1919. ENGINE PAN: Three-dip with wider front snout which will accommodate the larger fan pulley that didnt appear until 1920. OIL FILLER CAP: The mushroom-shaped cap, made of steel, three flutes. ENGINE CRANK: The plain steel sleeve type as used since 1914. The crank ratchet was held with a pin and cotter beginning about April, instead of the rivet used previously. ENGINE FAN: Driven by a leather belt from a pulley at the front of the engine. The fan hub was cast iron, with the blades riveted in place. Adjustment was by means of a bolt/nut arrangement located on the right side of the front plate and bearing against a boss on the mounting end of the fan bracket. MANIFOLDS: Exhaust pipe flared at the manifold and was held in place with the brass nut but with no packing. Intake was cast iron. CARBURETORS: Kingston Model L2, or Holley Model G. Choke arm had additional lever arm for dash-mounted choke pull rod. MUFFLER: Cast iron ends, same as 1918. In June 1918 the outlet in the rear head was moved ten degrees away from the bottom to direct the exhaust away from the spare tire. FUEL TANK: Cylindrical, under the front seat. Mounting brackets clamped to the tank. Outlet was between the center and the right side, between the frame rails. Sedan and coupe used the square tank, under the drivers seat in the sedan, and in the turtle deck in the coupe. COIL BOX ASSEMBLY: Ford. Same as used in 1917. Starter cars no longer had the ignition switch on the box; it was moved to the dashboard. The switch on the coil box was of the fully enclosed pressed steel design. Coils were all wood cased; the composition construction had not proved satisfactory. LAMPS: Magneto powered electric type on the non-starter cars, and six volt electric on the starter models. Black steel rims, and clear lens. Side and tail lamps were similar to 1917 on the non-starter cars. Starter cars had a small electric tail light and did not have side lights. HORN: Magneto powered electric on all cars. WINDSHIELD: Upright, with top section that folded to the rear. Frame was bolted to the brackets. Painted black. TOP: (Open cars). Top color was black on all open cars. Unchanged from 1918. SPEEDOMETER: No longer standard equipment. TURTLE DECK (on Runabout): Similar in style to the 1915. Handles are painted black.